570 Old Rutherglen Road, Gorbals, Glasgow. G5 0JS. 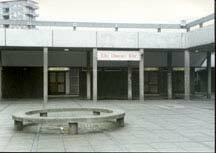 The Phoenix Bar was the first public house to be re-opened in the Hutchesontown area of the Gorbals redevelopment scheme in 1968. Licensee Donald A MacLean formerly owned the Coronation Bar at 570 Rutherglen Road some 500 yards distance from the new premises. The Phoenix was the reincarnation of the Coronation Bar. A tapestry mural in various colours with a Phoenix as its central feature gave an impression of modern flats rising from old tenements occupied a prominent place on one wall of the new lounge. Mr McLean had been in business for 17 years at his former premises the Coronation Bar. The Phoenix Bar was well designed and fitted out by shopfitters and consultants C Neeson, Govan Road, Glasgow. The new lounge had seating for 110 people with a U shaped and L shaped central seating area in brown Replin material. The bar had an illuminated canopy and a teak gantry with peach mirrors which matched the bar counter, the front of the bar gave off a reddish glow by concealed lighting. The bar could seat around 80 people, a feature here was two MacLean crests in tapestry at the gantry. The gantry continued through to a well designed off sales department. Interior view of the Phoenix, lounge bar with some of the guests at the opening, J McIntosh, C Blues, J McAulay, W Myron, Jack Gow, J Wylie. 1968. Mr MacLean was assisted in business by his wife Christine. Donald A MacLean took a keen interest in trade affairs, he was a director of the Glasgow and District Licensed Trade Defence Association and for a period served as a member of the Managing Committee of the Scottish Association. He was also a prominent figure in the Royalty Burns Club of which he was president. The Phoenix Bar was demolished to make way for the New Gorbals redevelopment scheme a few years ago, if Mr MacLean was alive today and walked along Rutherglen Road now he would not recognized the area which has brand new houses. 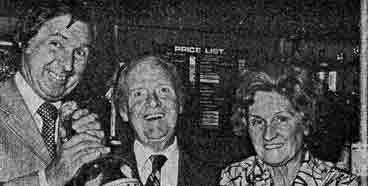 left to right Mr J Wilson manager of the Phoenix, Mrs Christine MacLean and Donald A MacLean proprietor of the Phoenix Bar. 1968. George Grier, third from the left, accepts chain of office from Donald MacLean. Watching are Peter Smith, Jack Gow, John Flynn, George Ramster, secretary, and Jimmy Milne, honorary member. 1970. Mr George Grier is the new president of the Glasgow and District Licensed Trade Defence Association. He succeeded Mr Donald A MacLean in the position last week at the meeting of members of the board of the Association. Mr Jack Gow was appointed senior vice-president, with John A Flynn as junior vice-president. Mr Peter Smith was appointed honorary treasurer. The new president belongs to a family well known in the Glasgow trade circles. His father, the late George Grier, was a director of the Glasgow Association and was treasurer from 1956 until his death in 1961. Mr Grier, sen., was also a past president of the Royalty Burns Club. Mr Grier's mother, too, has interested herself in trade affairs, and was the first president of the Glasgow and West of Scotland Women's Auxiliary Group, Licensed Trade, formed about ten years ago (1960). The two new vice-presidents also have family backgrounds with the Association. Mr Jack Gow, who, incidentally, is chairman of the Scottish Licensed Trade Veto Defence Fund is the son of the late Mr W B Gow, who served the Association for several years as president and who also served the Scottish Association for a period in a similar capacity, becoming an honorary president of the "Scottish." Mr John Flynn is the brother of Mr Thomas A Flynn, who has held leading offices in the trade, among them being the presidency of both the Glasgow and Scottish Associations, and who is an honorary president of the "Scottish." Mr Peter Smith is president of the Glasgow Vintners Association. For the third successive year, the Phoenix Bar, 570 Old Rutherglen Road, Gorbals, owned by Mr Donald A Maclean, collected the largest amount for the 25th (Hutchesontown) Ward Old Folk's annual treat. 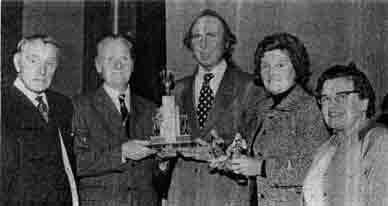 The picture shows Mr MacLean (Left) being presented with the Frank McElhone Cup by Frank McElhone, M. P. On the right is Mrs MacLean. Mr McLean has held the presidencies of both the Glasgow and District Licensed Trade Defence Association and the Royalty Burns Club. The second prize in the venture, the Alice Cullen Cup, was presented by Mr McElhone to Mr Tony Macaulay of the Pig and Whistle. 1971. For the fifth year in succession, customers of the Phoenix Bar, 570 Old Rutherglen Road, Glasgow, have contributed most for the senior citizens of the Hutchesontown area. 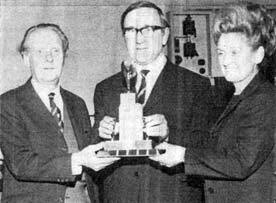 After dinner and a concert at the St. Mungo Halls, local M.P., Mr. Frank McElhone, presented the McElhone Trophy to Mr. and Mrs. D. A. MacLean, mine hosts of the Pheonix, seen with him. The Alice Cullen Cup was received by Mr. Tony McAuley, of the Pig & Whistle Bar, who came second. 1973. Winner of the sixth successive year of the Hutchesontown Old Folks Treat Trophy is the Phoenix Bar, Old Rutherglen Road, the donations of whose customers were once again a record. 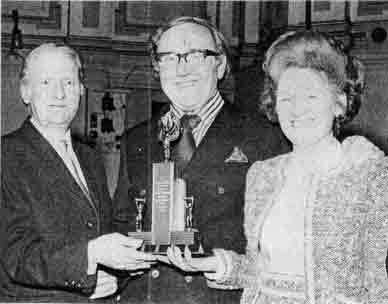 Receiving the trophy on behalf of their patrons are Mr. and Mrs. Donald MacLean from Bailie Pat Lalley (centre). On either side are Mr. and Mrs. Beattie, of the Old Folks Committee. 1974. At the Phoenix Bar, Hutchesontown, Glasgow, are George Watt (holding bottle), and mine host Donald and Mrs. Chris MacLean. From the £294 raised, 70 senior citizen customers were entertained to dinner and refreshments at the Phoenix. 1979.